Harry Styles at Radio City Music Hall in September. This was not my first Harry Styles experience; I've covered One Direction concerts before (e.g., 2015's Philly show, which might have been the boy band's last). And if there's one thing for certain, it's the potential for a loud crowd. Yet, when every young female fan's favorite band member — Styles — stopped by Upper Darby's Tower Theater on Thursday, all previous volume levels went out the window as the packed room's glorious acoustics magnified the sound of the 3,000-plus screaming girls tenfold. No one could blame the tween throng for the high-pitched hollering. Styles was always, in Beatlesspeak, "the cute one," as well as the band's deepest voice, longest hairdo, and the one picked to click beyond the boy band phase (think the British Justin Timberlake). 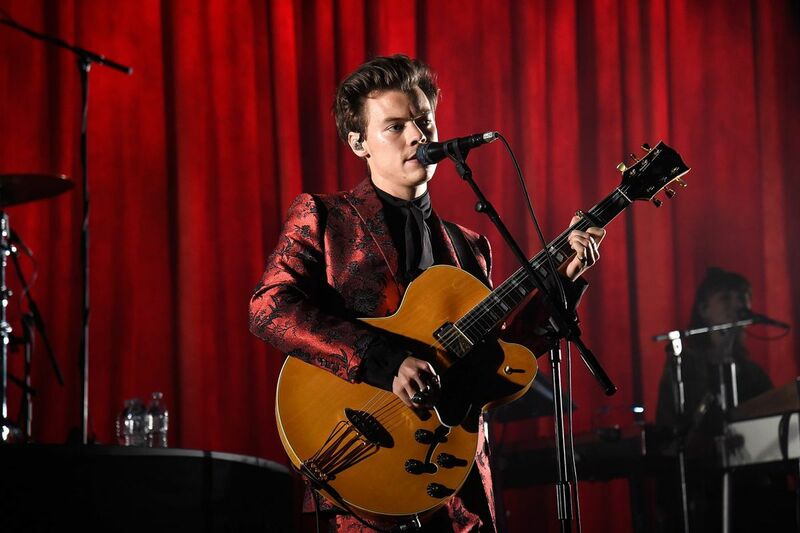 As a solo artist, Styles made a stunning, eponymously titled 2017 album with a mature mix of pop, yawning country, and dirty rock. He also became a movie star in a forlorn, cinematic wonder, Christopher Nolan's Dunkirk. What's not to yell about? The screechy crowd often overwhelmed Styles and his quartet, as the kids shouted along with him on every tune, which was a shame, because his greatest talents are his subtlety and nuanced musical qualities. His was a rich, resonant baritone that was bracingly endearing on the slow songs (the heroically swishing "Meet Me in the Hallway") and the cranky, glam rockers (the cocksure "Kiwi"). When he moved into a higher, more angelic range, that tone, too, was mighty and strong. There was a relaxed sensuality to his voice, nothing pressed too hard, but distinctive and quietly passionate. Get this guy a second album, and fast. Such softly complex tracks as the four-part harmony "Ever Since New York" and the country folksy "Two Ghosts" really didn't benefit from the crowd's atomic screeching. The fingerpicked, acoustic-guitar-driven "Sweet Creature" did not need an audience sing-along. Yet Styles seemed to take it all in stride. Pompadoured and dressed all in black (as was his band), he stood mostly still behind his microphone, even when tackling 1D hits such as the T-Rex-ish "Stockholm Syndrome." By the time Styles and company hit the breathy rocker "Only Angel," his thick hair began to bob. He addressed the Tower's front row and joked about some of the attendees' sash-and-tiara gear. From there, he ran stage laps, waved rainbow flags, and launched into a piano-pounding "Woman" and another 1D cut, the buoyant "What Makes You Beautiful." The only song that seemed off and out of place was the tepid "Just a Little Bit of Your Heart." Written by Styles for Ariana Grande, it was a dull lull in an otherwise smashing set. Luckily, Styles got his momentum back quickly and leaped into an encore that featured a rousing take on Fleetwood Mac's "The Chain" and his own grandly anthemic "Sign of the Times." If ever a song was written to be a staged finale, that was it. Styles didn't need to prove he could handle solo life away from his boy band. The serene and manly Harry Styles did that for him, one of the best albums of 2017. This show was just the wild cherry on top of a very gooey sundae.